1. There is an issue here of fate versus personal control over destiny. For example, Okonkwo’s father is sometimes held responsible for his own actions, while at other times he is referred to as ill-fated and a victim of evil-fortune. Which do you think Okonkwo believes is true? What do you think Achebe believes is true? 2. The threads of the story are related in a circular fashion, as opposed to a conventional linear time pattern. What effect does this impose on the tale of Ikemefuma? What effect does it have on the story of Ezinma? 3. The villagers believe—or pretend to believe—that the “Supreme Court” of the nine egwugwu are ancestral spirits. In fact, they are men of the village in disguise. What does this say about the nature of justice in general, and in this village in particular? 4. Certain aspects of the clan’s religious practice, such as the mutilation of a dead child to prevent its spirit from returning, might impress us as being barbaric. Which ones might appear barbaric or bizarre to an outsider? 5. In an essay entitled “The Novelist as Teacher, ” Achebe states: “Here then is an adequate revolution for me to espouse–to help my society regain belief in itself and put away the complexes of the years of denigration and self-abasement.” In what ways do you feel that this novel places Achebe closer to the fulfillment of this noble aspiration? 6. Nature plays an integral role in the mythic and real life of the Ibo villagers, much more so than in our own society. Discuss ways in which their perception of animals—such as the cat, the locust, the python—differ from your own, and how these different beliefs shape our behavior. 7. Of Ezinma, Okonkwo thinks: “She should have been a boy” (p. 64). Why is it necessary to the story that Okonkwo’s most favored child be a girl? 8. There are many proverbs related during the course of the narrative. Recalling specific ones, what function do you perceive these proverbs as fulfilling in the life of the Ibo? What do you surmise Achebe’s purpose to be in the inclusion of them here? 9. While the traditional figure of Okonkwo can in no doubt be seen as the central figure in the tale, Achebe chooses to relate his story in the third person rather than the first person narrative style. What benefits does he reap by adopting this approach? 10. Okonkwo rejects his father’s way and is, in turn, rejected by Nwoye. Do you feel this pattern evolves inevitably through the nature of the father/son relationship? Or is there something more being here than mere generational conflict? 11. The title of the novel is derived from the William Butler Yeats poem entitled “The Second Coming,” concerned with the second coming of Christ. 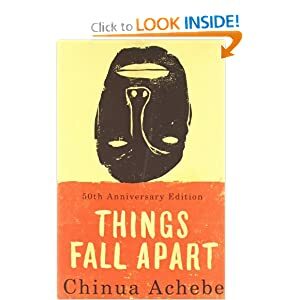 The completed line reads: “Things fall apart; the centre cannot hold.” What layers of meaning are discernible when this completed line is applied to the story? 12. The text includes many original African terms and there is a glossary provided. Do you find that this lends atmospheric authenticity, thus bringing you closer to the work? Do you find it helpful?